This week Science for the People is talking about the use – and appalling misuse – of genetics in pursuit of human perfection. 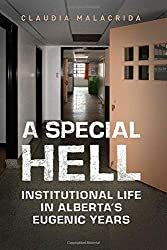 We’ll speak to Claudia Malacrida, sociology professor and eugenics researcher, about her book A Special Hell: Institutional Life in Alberta’s Eugenic Years. We’ll also talk to Hannah Brown, postdoctoral researcher at the University of Adelaide, about the ethical issues raised by the creation of a genetically modified human embryo. This entry was posted in Follies of the Human Condition, This Mortal Coil and tagged A Special Hell, Alberta, Claudia Malacrida, CRISPR, eugenics, Hannah Brown, Podcast, science for the people, University of Toronto Press. Bookmark the permalink.